Discussion in 'Car Builds, Projects, Idea's Experiments' started by RallyMini370, Mar 27, 2012. By this time next week I should have sold my Rally Subaru Legacy and have some cash to start building the car. First thing is to get the car running and get the state test. Then start selling off all the stuff I don't need, like ABS, Airbags,A/C etc. Anyone know what belt to use without an A/C? The belt is the same. The pulley that replaces the a/c compressor is a direct fit. The only variance is your supercharger pulley size. Stock to 15% = Napa 060539, 17/19% = Napa 060535. Thanks but this is not the S...I wish it was! What will you be running as far as a skid plate? Also are you building your car for rally-x or stage rally? Wow that looks low! I'm going to run the Cooper on rough gravel rallies and some tarmac. Home made skid plate. I'm going to look for a smaller belt if one exists. My Suzuki GTI belt is small so I might start there. Kicked off the build today and hit problems. As reliability wins rallies I'm replacing the water pump with a new one but the bolts were scary stuck until I slowly got them out. Then I found the metal coolant pipe was really coroded, also the radiator fan sounded a bit suppect so I'm replacing that too. I got the "S" cylinder head on but not connected everything up yet. The original raditor will be toast in no time being plastic ends so I've opted for a 4 core rally aluminum Subaru WRX radiator which will fit after some modification. I plan to junk the plastic surround and make the bumper a one piece off for easy access. Also I found a belt to run the alternator/water pump without the need for the dummy A/C pulley. That was some week! finally got the Subaru WRX radiator in, a 165F thermostat, Way motor mounts, Lowes CAI hahaha, Computer servo fan for the power steering pump, custom mesh grille plus putting the head back on. I hope tomorrow to have the car running. Last week was an all out attack on removing the extra wiring I don't need, such as rear wiper/window heater, airbags, speakers and door mirror. This is best done with scissors and gloves as the black mess thet wrap around the wires is very sticky and messy. I managed to remove all the wires up to the bulk head, and then I cut and taped them off until I get the car to Costa Rica when I will remove the dash and heater to remove those wires I can't get at. Everything else is about done apart from some brackets to drill out. As I only get a few hours a night so I have to make a good progress! I finished drilling out brackets I don’t need, wrapped electrical tape around the wiring loom, moved the fuse box to a better location. Stripped the front seats to make a temporary support for the OMP seats until I get the cage in which will also support the seats. I used the base of the seat with welded on brackets to bolt the seat to. This give me some driving position adjustment before I permanently secure the seat in. Looks like a jet fighter seat! Hahaha. Today was the first time I really got to drive the car and I can say it's pretty good. Seems to be nearly as fast as the Swift but the handling is very nice, even got a bit sideways this morning which I like! The D1 set at SP9 makes the throttle respond as I like it. I'm happy to report that the WRX raditor performs better than I expected. Driving around the temp reads about 1/4" below normal and in traffic goes up to normal without the use of the cooling fan which I have a manual switch. I sat for 40 mins in traffic at 75F outside temp with the needle at normal. If I flicked the fan on the temp needle dropped 1/4"
"The D1 set at SP9 ..." Translation please? That is one light Mini. yeah until the cage goes in, then I'll have to go lighter! The goal is 2028LBS with the cage in. R56 rear suspension will knock off a few! Are you going to do carbon panels? I race a stripped out VW fox, with a full cage and fuel is 2,000 lbs on the money. 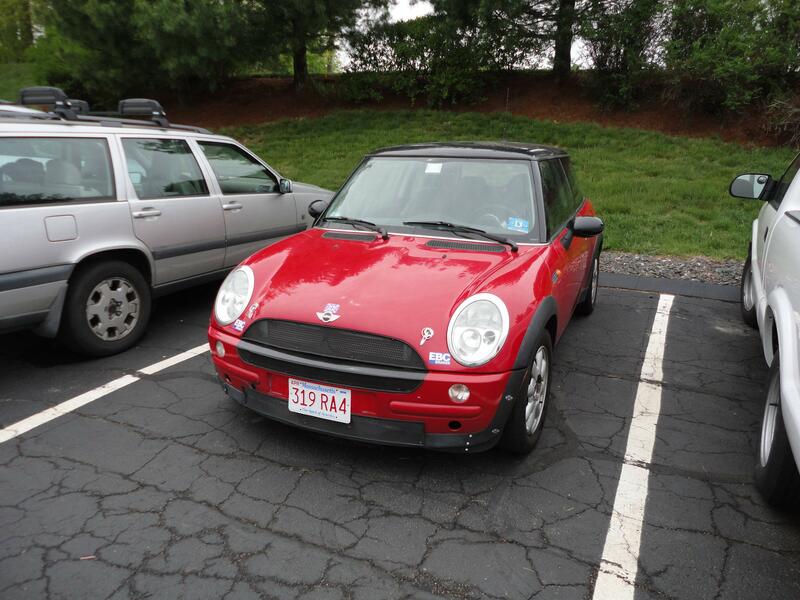 If you get the Mini down to that level, after a cage, thats going to really move, even for just a cooper. (I think the R50 is about 100 lbs lighter than the R53, correct me if i'm wrong). Cone you are correct about the weight difference. I don't know the exact figure but it is around that. No intercooler, supercharger, lighter exhaust, etc. etc. it adds up quickly.